When rats infest your home, think of them as tenants who don’t pay rent and won’t clean up after themselves. Evict rodents from your premises by calling a professional who knows how to get rats out of attic spaces, walls, ceilings and crawl spaces. One of the first things our wildlife removal company does is come out for a free inspection. We can find out how the rats or mice are getting into your home. In this case, we could quickly see that overgrown vegetation was the key to their gaining entry. 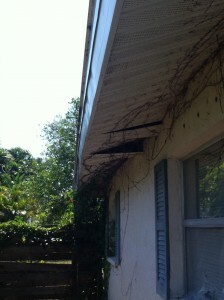 Trees and shrubs growing too close to the siding caused an opening in the soffit. That’s where the rodents were getting in. Next, we cut back the foliage surrounding the house, closed up the soffit, and trapped the rodents that were still indoors. When rodents can’t get in and have no place to hide outdoors, they’re much more likely to move on to different stomping grounds. Similarly, if you’re trying to figure out how to get mice out of attic areas, kitchens, cupboards and baseboards, we have fast, efficient solutions for trapping and removing them, and the right equipment for cleaning up what’s left behind. We’ll evict rodents from your home like a landlord who’s fed up with a bad tenant. Don’t try to handle this problem yourself. Misuse of poisons and using the wrong kind of trap can make the infestation worse and your property damage more expensive. If you’ve been searching for how to get mice out of attic spaces, we can do it for you, quickly and safely. And if you’re worn out from wondering how to get rats out of attic areas, we’ve got those answers, too. Give us a call, and soon you’ll be enjoying a peaceful, clean, rodent-free home.